The humble granny square is probably the most ordinary, common, and well known motif in all of the crochet world. Even non-crocheters recognize this stitch pattern. I’ve had a few students come to a beginning crochet class JUST because they want to learn how to make “the granny square”. It’s a great way to begin your crochet skills, and even after you’ve been crocheting for a while, there’s something comforting about returning this common, ordinary motif. With an artful eye, however, one can transform this ordinary stitch pattern into a feast for the eyes. 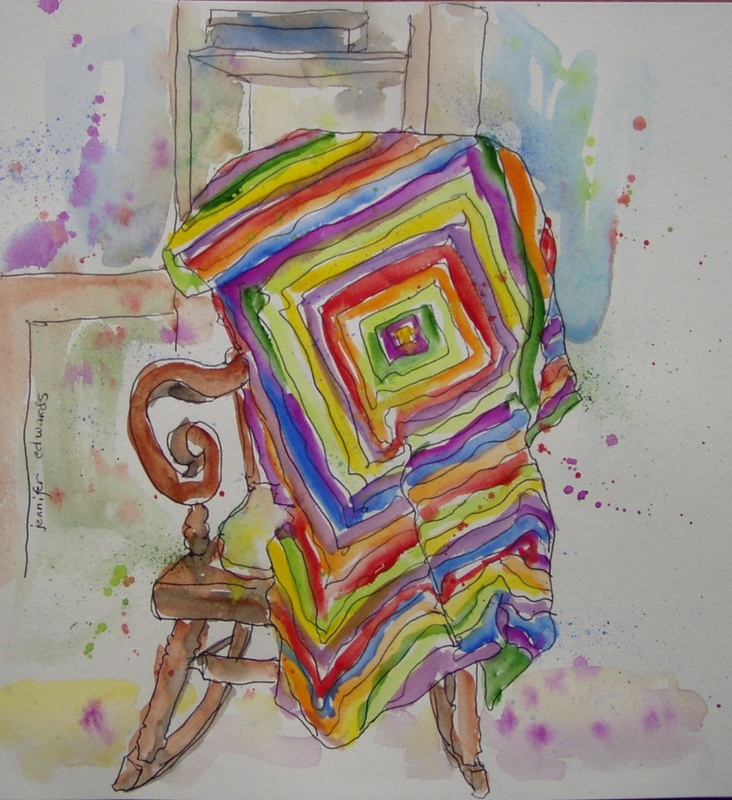 We have lots of crocheted throws around our house. Some I have made, some that my husband’s grandfather made, and a knitted afghan my mom made. Our family loves these warm, curl-ups pretty-much year round. I have a knitter/crocheter friend who believes that hand-made afghans have healing powers. I don’t know any medical statistics on this, but they definitely make you feel better when you’re sick, cold, or just wanting to be comfy and cozy. I think quilters also enjoy this about the quilts they make for themselves and for friends…tangible love, warmth, and beauty all in one. And did I say, this is a FREE pattern! Please download and enjoy it this season! You’ll be able to see how I’m writing these patterns…tons of helps for you to make your knitting/crocheting adventure successful from beginning to end! 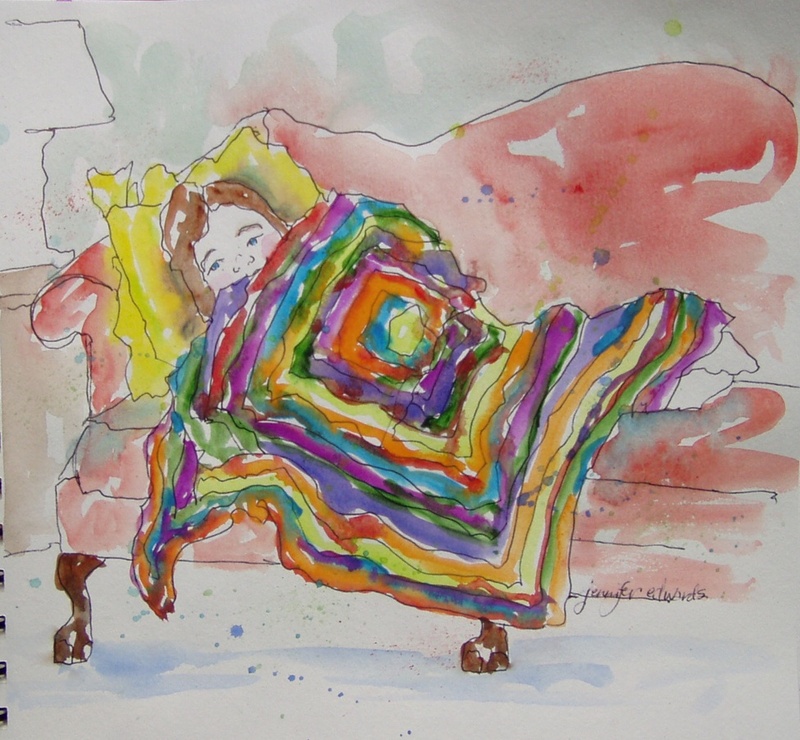 I love the painting of a sweet little somebody curled up under the throw! Wonderful, colorful little paintings here! I can picture the actual pattern but I just love the paintings! I love these paintings! They really capture the essence of those afghans, and the memories that they bring of MY childhood. My grandmother, who passed away 14 years ago, used to make them for us… I miss her and her afghans, and the slippers that appeared every birthday, every Christmas, every change of Season, etc…. Your paintings are so delightful.There is such joy! Your paintings just make my heart sing! I love your work! WOW- I love your pattern and the watercolors. You have such a gift in two areas. Please keep it up. Lovely colors. Great pictures. Haven’t made a granny lately. Been using my stash for knitted blankets. Hi Jennifer – Tammy had me look at your website to see your art (very nice) and also forwarded it to my sisters in PA – both crochet and one is an artist in her own right, painting and sculpture – lives near and is good friends with the Vanderarks, who used to attend Redeemer – anyway, if you’re not already familiar with it – check out http://www.civa.org -it’s a website dedicated to art corum Deo. Hi Tim…thanks for visiting these sites and for the link to CIVA. I do know about this group, and my dad is a member of CITA (the theater arts version). Hope you and your family are well…we are so glad you all are a part of our Grace family.